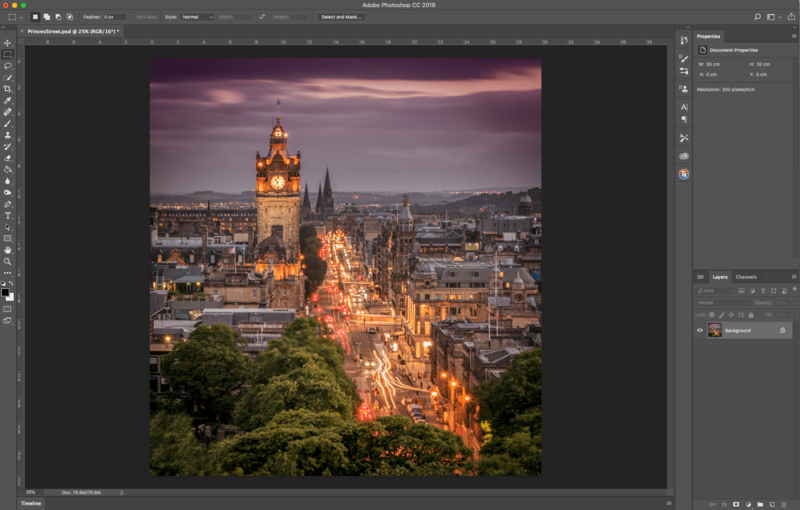 If you want to use a Brush to selectively darken or lighten part of your image you can of course use Photoshop’s built-in Dodge and Burn tools. The Dodge tool lightens the brushed area and the Burn tool darkens. Right-click on the tool icon to select the one you want. The problem with these tools is that you cannot conveniently modify any changes you have made other than by using Undo in the Edit menu. But there is a non-destructive way of Dodging and Burning. 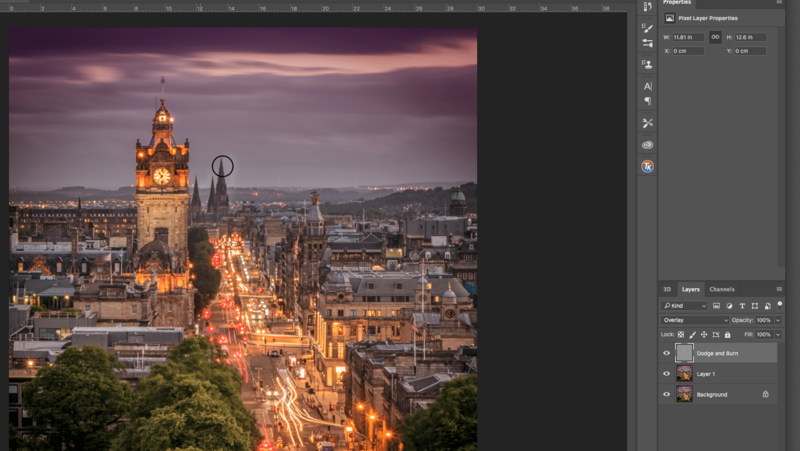 Here’s an image of Princes Street in Edinburgh for us to work on. Let’s say, for example, we want to lighten the buildings at the end of the street. I usually start by making a copy of the layer. 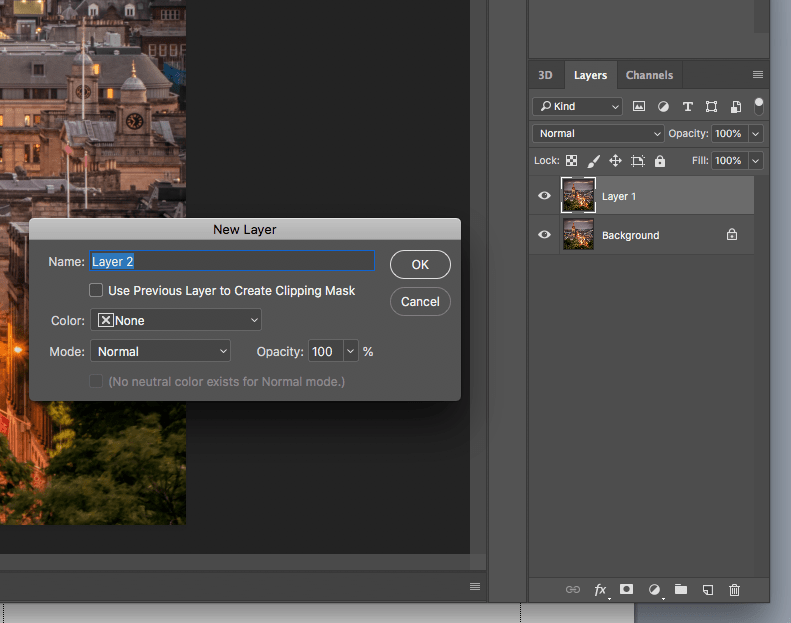 Select the layer and press cmd-J on a Mac (Ctl-J on Windows) to make a copy. Now we need to make our Dodge and Burn layer. 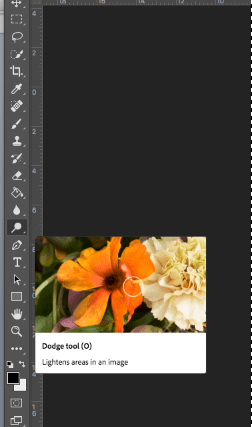 Hold down the Alt key on a Mac (Option key on Windows) and while it’s held click on the Create a New Layer icon. A dialogue (ie settings box) will appear. 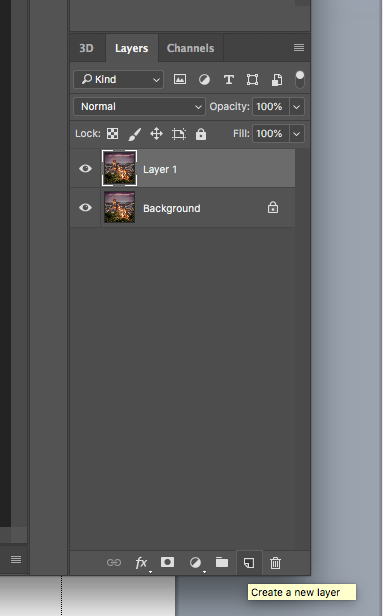 Set the Name to Dodge and Burn, the blending Mode to Overlay and tick the box to set the layer to 50% grey. Click OK. 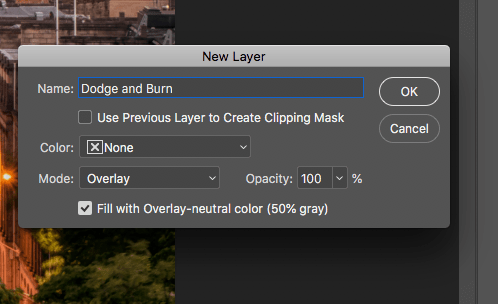 This creates a layer that is 50% grey and Overlay mode means that it blends with the layers below such that any pixels in the image are completely unaffected where the overlay layer is 50% grey. If the overlay layer pixels are lighter than 50%, the underlying image will be lightened and where the layer pixels are darker than 50% the underlying image will be darkened. Set the foreground colour to White or Black depending on whether you want to lighten or darken and set the background to the opposite. You can then easily switch between White and Black by pressing the ‘X’ on your keyboard. So, to lighten the buildings, make sure the foreground colour is set to White, select the Brush Tool and adjust its Size and Hardness. I usually set Hardness to 0% when dodging and burning to give as soft an edge as possible. Initially set the Brush Opacity to a low value according to how much lightening or darkening you want to produce. Then, with the Grey layer selected, paint over the buildings with your White brush. Use a Black brush to darken again if required. 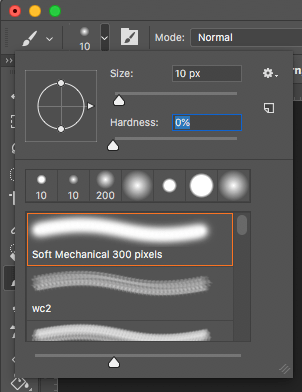 As well as adjusting the Opacity of the Brush, you may find is easier to control the amount of dodging and burning by adjusting the Brush Flow, especially if you have a pressure-sensitive graphics tablet. 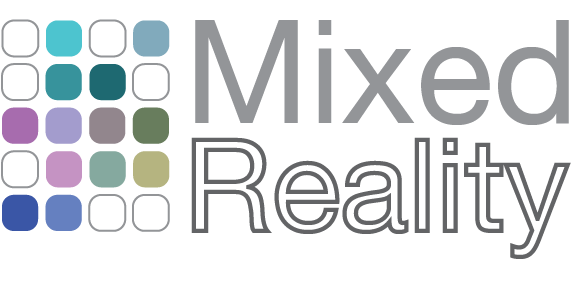 In effect, Opacity limits the amount of ‘paint’ applied and this applies no matter how many times you paint over an area. On the other hand, with Flow, every time you paint over an area more ‘paint’ is applied and it becomes more and more opaque.